22 Feb 2018: Indigenous Accountants Australia is pleased to welcome Matthew Lancaster to the team. 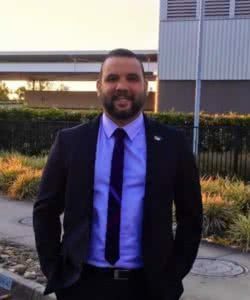 Matthew joins us as the new Relationship Manager, Indigenous Strategies for New South Wales and the Australian Capital Territory. Read more about Matthew below. I am a descendant of the Trawlwoolway people of north-western Tasmania. Born in Hobart, my family moved to Queensland when I was 11 years old. After high school, I was selected for the Rotary Youth Exchange Program where I resided in Thailand for a year completing an extra year of schooling. In my young adult years, I worked in the coal mining industry in Central Queensland for two and a half years. However, my real passion was always to work for the community. In 2005, I joined the Queensland Police Service. During my time with the police, I was stationed at Boondall, Brisbane City, Fortitude Valley and Palm Island Police Stations. In 2012, I opted for a change of uniform and enlisted in the Royal Australia Navy. I have been awarded the Australian Defence Medal and received awards for Recruit of the Intake, Maritime Warfare Community Medallion and Dux of the Leading Seaman. I have served on HMAS Tobruk and HMAS Canberra where I was deployed on Humanitarian and Disaster Relief to Vanuatu and Fiji. My most notable time was being part of the Navy Indigenous Performance Group, Bungaree. With a career spanning over ten years with Government organisations I have come to realise that it is not only the number of Indigenous people in an organisations that help make a difference, but it is also important for them to be well educated and trained. My qualifications include a Certificate IV in Justice, a Cert ificate IV in Indigenous Leadership and a Diploma in Policing. I am currently in the process of obtaining Diplomas in Leadership & Management, Human Resources Management and Business Management. For me, I have served my Community, my Country and now it is time to serve the people of Australia. With that, it is such an honour to be part of this journey with two esteemed organisations on the Indigenous Accountants Australia project. If we are to address the disadvantages of Aboriginal & Torres Strait Island People, we must provide a culturally welcoming, responsive and culturally competent services if we wish to progress forward in Closing the Gap. IAA is definitely leading the way with their continual support to redress the under representation of Indigenous Australians in the accounting and finance profession. By increasing the number of Indigenous Australians with accounting qualifications and supporting them, we will continue to improve the growth and development of indigenous businesses and communities. With a qualification in accounting, our Indigenous people will be the leaders of tomorrow and the role models for future generations.